So I've been busy... I noticed that seven days after my 21 birthday I wrote that I hate everything and I have really no idea why I wrote that. But yeah, I went to a Halloween party or "sittning" as we say in Lund. It was a lot of fun, I love love love halloween and maquerades! I love to try new costumes and I wish that every party would be masquerade themed so I could do every idea I got! 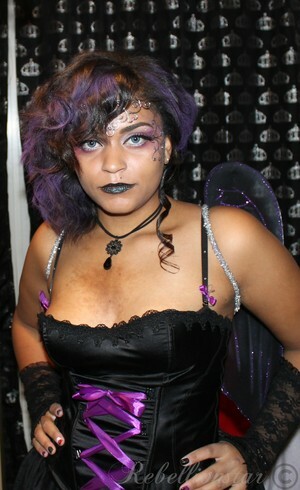 I was a evil fairy/dark fairy and I think it was the best idea I could ever come up with! I'll post a pic at the end of what I looked like. After that it was november and I moved from my crappy corridor to an apartment with my friend. It's so good to have a clean nice kitchen and bathroom. AND I GOT A BATHTUB. Best thing ever. And I love my room. My family came down to help me move and they brought me a sofa, my 120cm bed, a new cabinet. Well the cabinet aint new it's from the 1940 but it's new for me! It turned out better then expected! It's like my dream room as a teenager! They brought some other things that I needed like my pink garbage bin and my stereo with a lp player. Well that's all for now got nothing else to say at the moment! Here is the pic!